The Newspaper theme is so versatile, that you can choose where you want to use the menus. 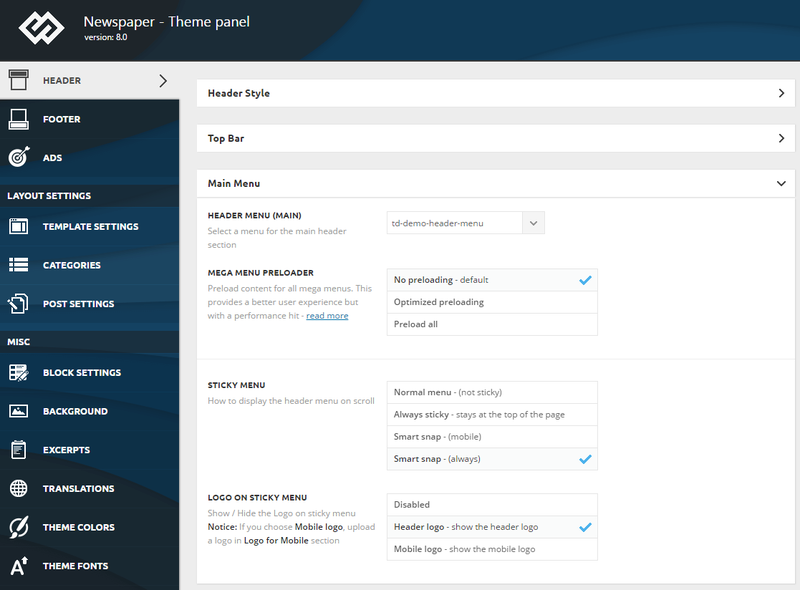 The theme supports custom WordPress menus, with multiple levels of drop down for the main menu. There are 3 areas of the theme where you can display a menu: the Top bar, the Main Menu and the Footer Menu. In this section you will learn how to create a new menu, make it a sticky one (on desktop, mobile and retina ready devices) and customize the Main Menu. The theme comes with some general options for the Main Menu. Go to Theme Panel > Header and expand Main Menu section. This option allows you to load a menu created earlier as the main menu. With this function, you can also choose to display a menu for the footer or the top bar. This option gives you the freedom to decide how to display the header menu on scroll. Normal menu – This is a non-sticky one. Choosing this will make your main menu stay fixed in the top section of your website and will disappear from the viewport when you scroll down the pages. 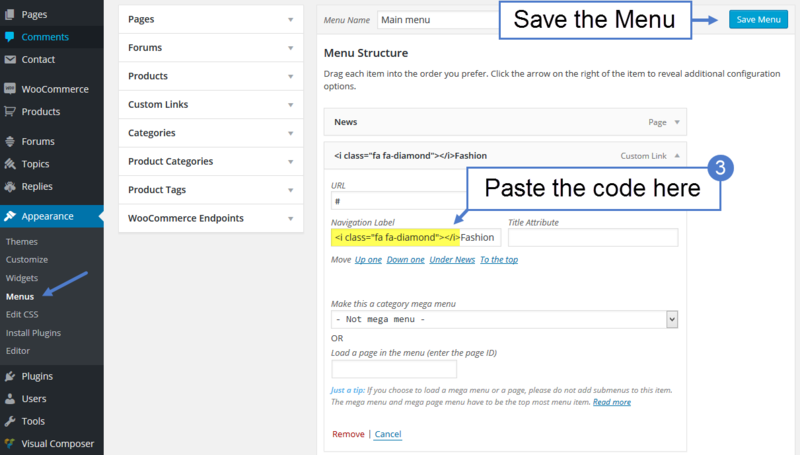 Always sticky – This option makes your menu sticky on your website. Even when you scroll down the pages, the main menu will always stay on the top section of your viewport. Smart snap (mobile) – This option defines the behavior of your main menu on the mobile and retina ready devices. If you choose this option the sticky menu hides on mobile devices when you scroll down and it shows up when you scroll up. Smart snap (always) – This option defines the behavior of your main menu on the desktop and the mobile and retina ready devices. Choosing this option the sticky menu hides when you scroll down and it shows up when you scroll up, extending the viewport for a better user experience. You can decide if you need a logo to be loaded on the sticky menu and how should it behave in different environments. Mobile logo – This option allows you to add to your sticky menu a mobile logo. 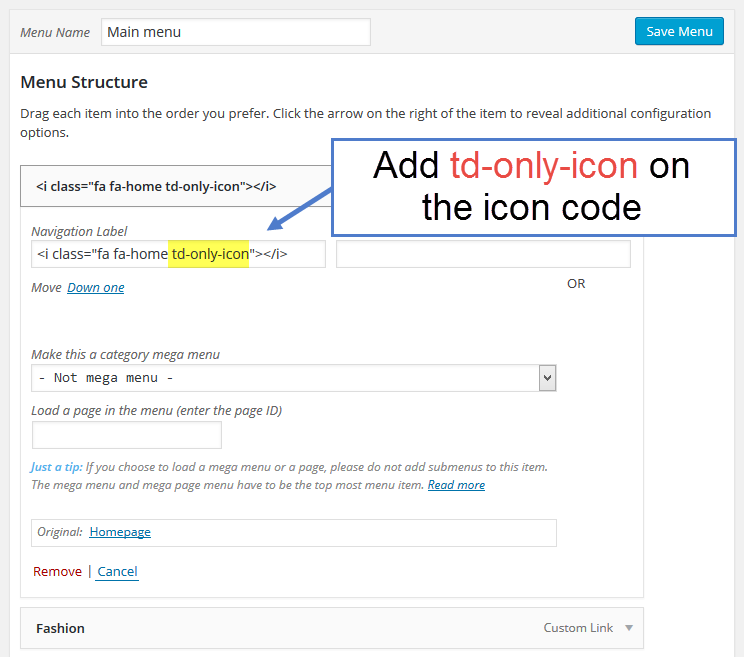 Notice: You can use this option only if earlier you uploaded a mobile logo (Theme panel – Header – Logo for mobile). You can manage your menus by using the drag and drop functionality and rearrange the menu items in the desired order. 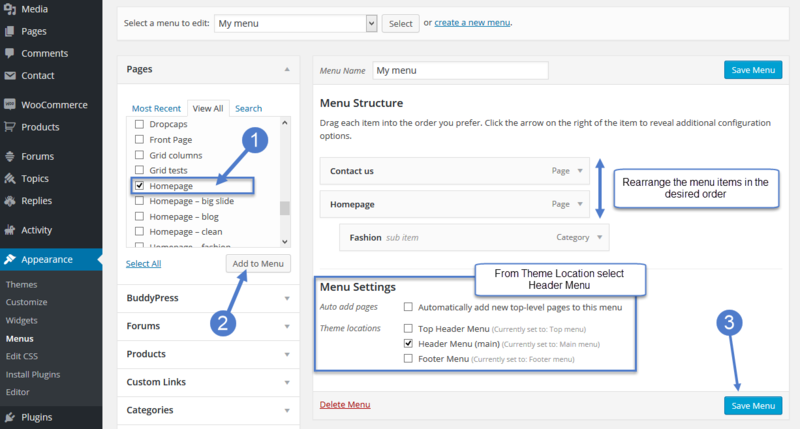 After setting up your menu, scroll down to the bottom of the page and assign the menu to one of the 3 Theme Locations at the bottom. Select Header Main for Main Menu. Go to Plugins -> Add new and install Font Awesome 4 Menus plugin. Go to Appearance -> Menus and select a menu that you want to edit and paste the icon code in a menu item, then save the menu. If you want to add only an icon in a menu(without text) add this td-only-icon to the icon code for a better alignment.